Investment is a word that we associate with money as it is mostly used in popular cultural language as a means of explaining the accumulation of wealth. The definition of the word has many meanings: Assets- Speculation- Venture -Outlay-Stock- Share- Security- words that we have come to be associated primarily with hard cash. Breaking down the language and taking the implicit meaning out of the word “investment” and really examining what is literally meant by ‘Outlay’- ‘Share’ and ‘Security’ paints a different picture to the one created by financial wizards and money experts. I understand the word ‘Investment’ to mean many things, but my primary use of this word is in a different context to its more popular appearance in financial journals, newspapers and media sound bites. Investing in people is something that I do. Personally I have been lucky to be the recipient of wisdom and knowledge from some very special and wonderful people and I believe in passing it on. This is what I consider to be a relevant and real investment. Speculating on something and hoping for a return is something that is not exclusive to the money markets and like the gambler, sometimes you win and other times you lose. Is life a game? Knowledge is a wonderful thing and I simply believe that to share it is an investment in the person that you are passing it on to. Trusting that they will in turn share the same knowledge and pass it on is all I ever hope for. This way the investment pays off for me. I have no wish to keep for myself the vast experience and learning’s of others and I am a willing broker who wants everyone to become rich by the same methods that have made me the person that I am. This primary ‘investment’ in people provides ‘stock’ in a range of skills and learning, and ‘security’ in the belief in ourselves as humans. This can turn lives around in a way that fundamentally changes us as people that is unrelated to money or to the accumulation of wealth. As humans we possess ‘assets’ that are as priceless and as individual as we are and we all have the ability to ‘share’ them with others. I believe that putting the real meaning back into some of the words that have been taken from us by bankers and financial gurus is a good place to start. Investing in people and continuing to believe in them is something that makes me wealthier than any banker on the planet and the ‘trade’ that is generated by the reciprocal sharing of knowledge is something that to me is richer than gold. Destiny does not happen in a vacuum, but is shaped by our individual lived experiences. Mortality or death is something that surrounds us every day. We are faced by the brutality and sadness of it in every news bulletin and newspaper that we read, and although it is a part of our daily lives, it is usually about someone that we don’t know. Someone distant who we might think about fleetingly but are not connected to. We may feel momentarily sad for their circumstances and for the people who might mourn their loss, but really their deaths don’t touch us, as it is about someone else- someone unknown to us. Facing death with someone you love is altogether different. Ultimately we all know that we will die, but while we are young we manage to put that notion of death on the long finger. The Grim Reaper is not for us! Most of us imagine that we will grow old and die a peaceful death (if and ever we have a moment in our busy lives to even contemplate it). The reality of living with mortality is heavy and dark, and I believe that we never really consider it until we are faced with losing someone we love or have actually lost. Coming to terms with a life threatening terminal illness is an indicator of how powerless we really are as humans in the face of disease. We may have the will to live, but “fate “can decide otherwise. 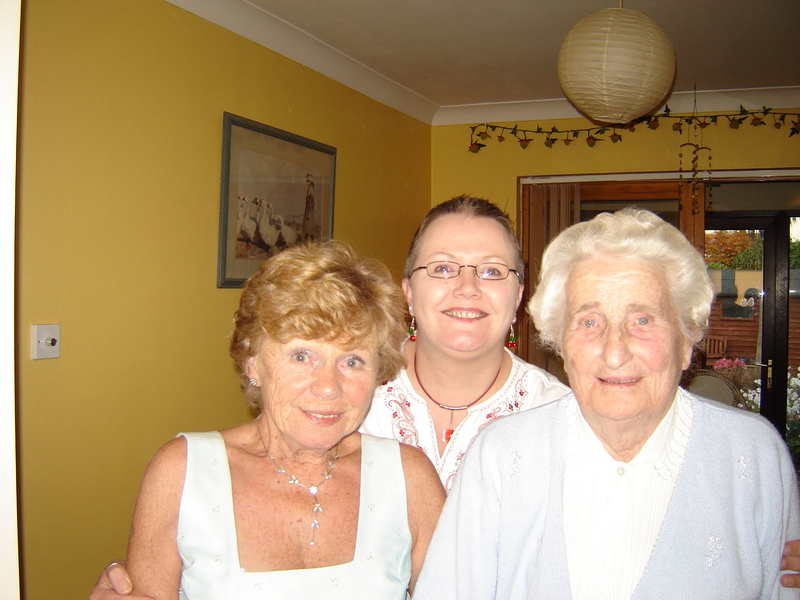 I am currently facing uncharted territory with two special wonderful much loved women, my mother and my mother in law. My mother is 82 and has terminal breast cancer, and my mother in law who is 93, is in the early stages of Alzheimer’s . Watching these two wonderful women cope with their disease’s while hoping for a positive outcome humbles me as I realise that they do not want to die. They struggle every day to hang onto life despite their pain and suffering. They are on their own particular course and I am on mine. They will ultimately die, and in time they will be gone. I will have to cope and get on with living although my heart and life will be bereft without them. This is my tough future. Loosing someone that you love unexpectedly is horrendous as you have no warning –like the sudden death of my darling younger sister Annie, but loosing people that you love dearly day by day, little by little is tougher still. Having to be emotionally strong and to pretend that somehow death is within our control is exhausting, and providing reassurance knowing what the eventual outcome will be, is heart breaking at this moment in time. Cliché’s about ‘living life in the moment so that you will not feel regret in the future’ are easily spoken or read. They are harder to live by when time is taken up by the day to day management of hospital appointments, shopping, meal making and other mundane repetitive household chores that have to be completed. None of these things really matter in the grand scheme of things, and although it keeps a semblance of order in the minutes, in the hours, in the days, in the weeks that go by, it is all meaningless in the context of what lies ahead. At the funeral, will people remember that the house was clean and that the dusting was done? Will it be noted that the carpets were vacuumed and that the kitchen towels were matched? I don’t care about this and I am sure that the people who will come to mourn with me in the future do not care either. In the time that is left I want to tell these lovely women to forget about the house work and all of the stupid household tasks that are rendered useless and meaningless in the face of death. I want them to embrace sunshine as the day dawns, and to smell the sweetness of summer flowers. I want them to rejoice in the simplicity of living and to enjoy if they can, the wonder of a star filled night. I want them to enjoy ice cream dribbling down their fingers as they try to catch the last bit, and to do all the things that are possible in the time that they have left. These are the things that I think are important, but I realise that what I want may not be a part of their thinking as they struggle towards an unknown future. Living with their uncertainty has changed my own perspective on life, and the clichés about living in the moment have never held more resonance than they do now. Living life and facing death is not just my destiny, it is universal to us all.